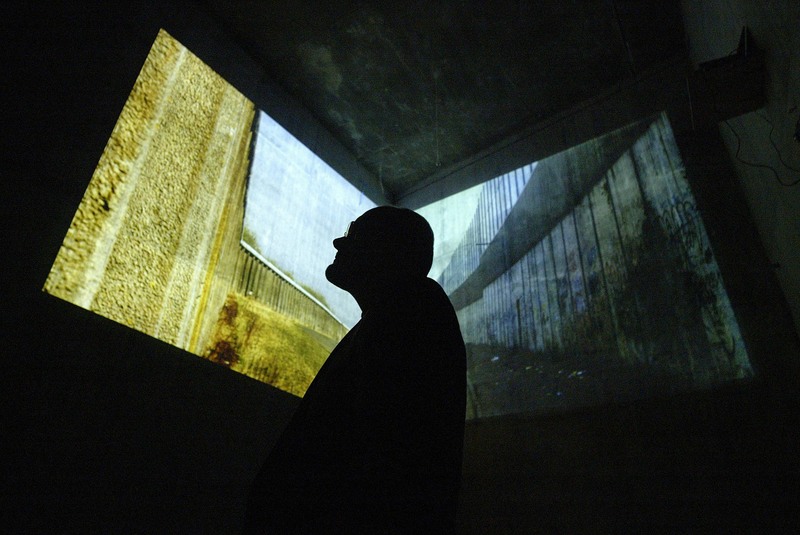 This installation work was exhibited in The Lagan Tunnel, beneath the River Lagan, Belfast and at an earlier stage in the gallery at Conway Mill. 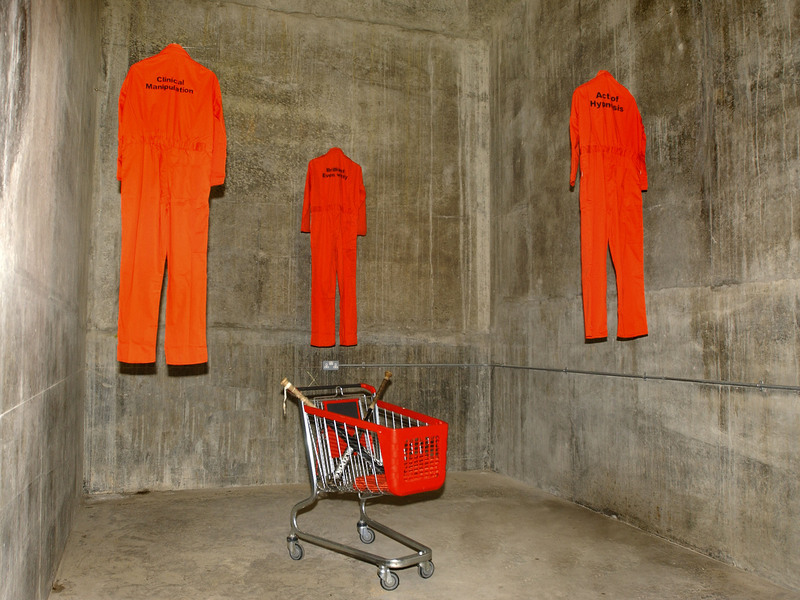 The Tunnel was the perfect venue for artwork that explored issues of cultural confinement. 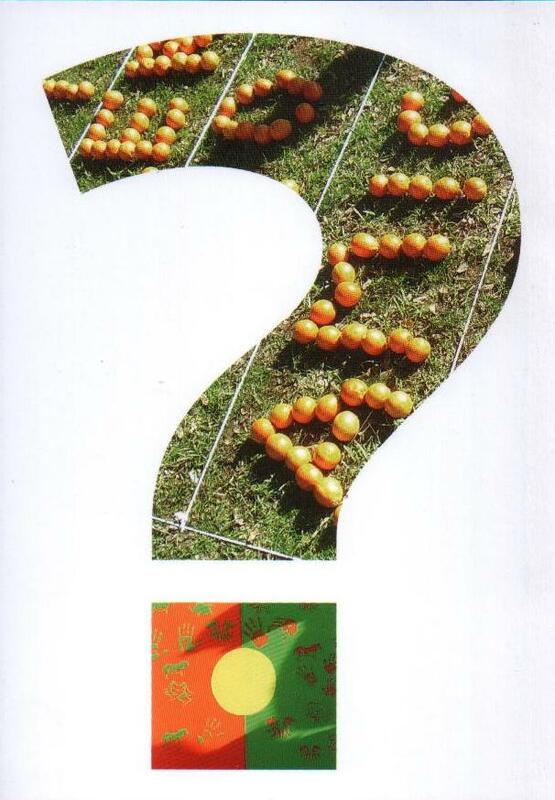 Below is the Question of Peace installation in Valencia, Spain. Click on any image to reveal the full size. This installation raises questions about freedom and captivity – and ‘prisons’ that are unseen. Perceptions is a confined space with enough room for one person to sit at a small table. The viewer is confronted with a rusted etched steel security map of the Maze prison. On the right hand wall is another etched plate with hand prints and finger prints of family groups. 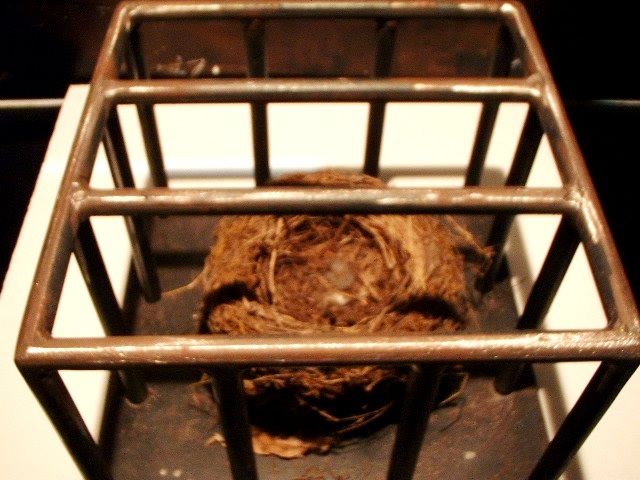 Through the spy-hole slit the viewer sees a birds nest inside a barred steel cage. This installation is loosely inspired by a Maze Prison visiting box. When families came to visit their relatives they were presumed to be free – often the families were in fact prisoners of a variety of intense situations. The viewer is initially in the role of ‘visitor’ but when they look through the spy-hatch at the bird’s nest their role is brought into question. 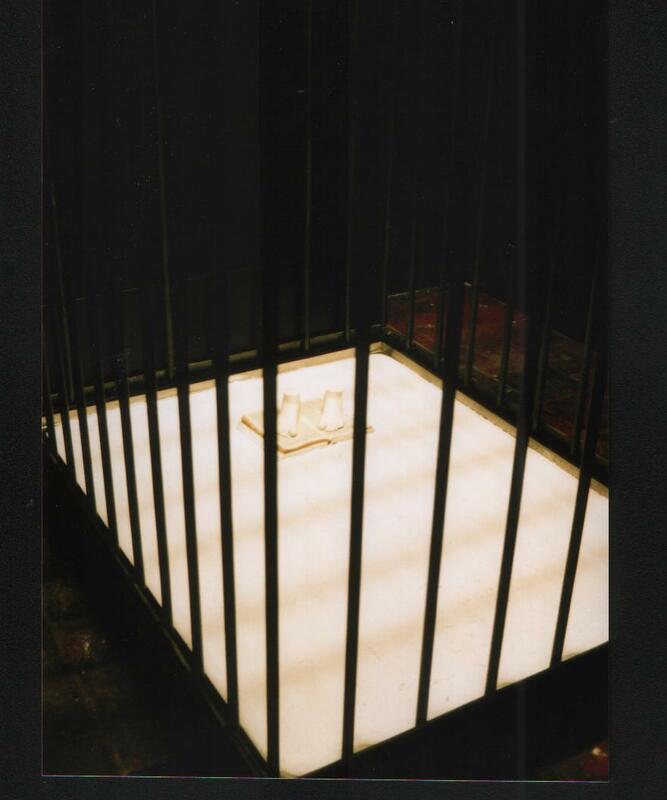 This piece explores an act of violence and asks questions about control, power, authority and imprisonment. The viewer enters a darkened space that is illuminated only by a red spot light and two light boxes covered with the Duratran images. On a pedestal in the middle of the floor are four plastic bullets cast in polished bronze. 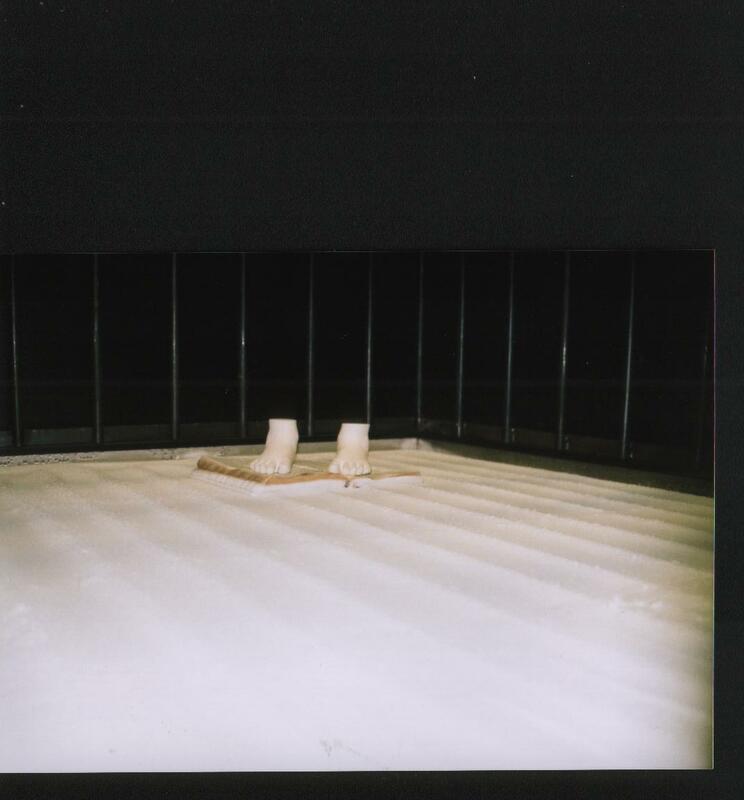 The Duratran images are of a lookout tower that has its security window shot out by a plastic bullet – the window was shot out from inside the tower by security personnel. The second image is a view from inside the tower looking out the smashed security window. 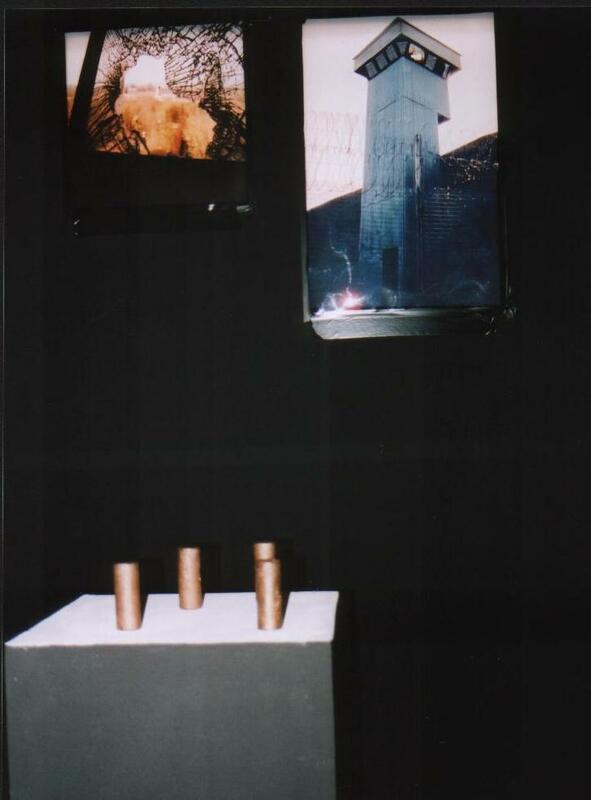 The bronze bullets were cast from plastic bullets found by the artist around the bottom of the tower. Material: Photography, projection and the heavy sound of hammer and chisel every 10 seconds. Dimensions: 15ft x 20ft projected on two adjoining walls. The juxtaposition of the Falls/Shankill peace wall with the perimeter wall of the Maze Prison goes back to my core theme. The image of the ‘peace wall’ is a manifestation of the barriers of belief that we carry in our minds. The heavy sound of a hammer and chisel against a concrete wall every 10 seconds provides some space for hope and can also replicate to sound of a rifle being cocked. Material: Freezer condenser unit, Bible, white plaster and steel bar. Dimensions: Floor – 8ft x 4ft. This piece raises questions of security and entrapment. Issues of identity, religion and factional beliefs are relevant to communities across the globe. The Bible is a totemic symbol of established belief systems; systems that people feel secure within. There is often a belief that anything outside of the safety zone will be uncomfortable. This During the Blanket Protest (or Dirty Protest) naked prisoners were often left for long periods in cold empty cells. The law stated that a Bible had to be in cells at all times; so prisoners used to stand on the Bible to keep their feet warm. That is where the image came from. The condenser unit reduces the temperature of the steel floor below zero causing moisture from the circulating air to freeze on contact with the steel. This creates a floor of frosted ice. 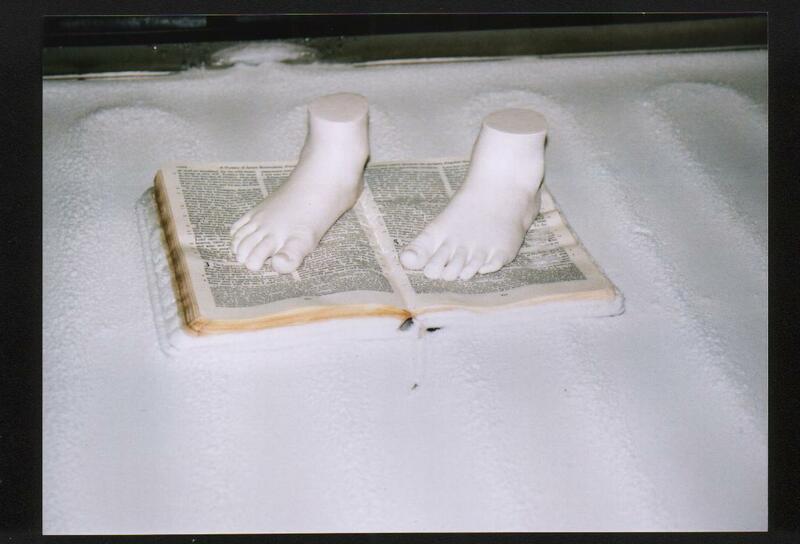 On top of the ice floor is an open Bible on which stands the white plaster casts of an infants feet (my three year old daughters). 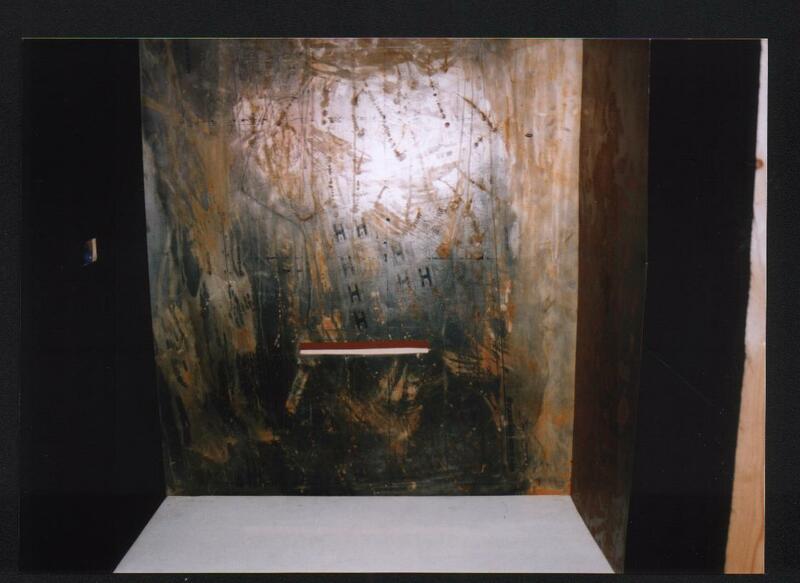 The feet and the floor are enclosed in a steel barred cage. Material: Shopping trolley, orange boiler suites, baseball bats and Harold Pinter quote – ‘Clinical manipulation’, 'Brilliant even witty’, ‘Act of hypnosis’. Fair Trade explores issues of violence that are explored on the basis of the belief of ‘good over evil’. This work references of hostages and prisoners, the commercial nature of conflict and political spin. Material: 1000's of oranges picked from a local orange grove. 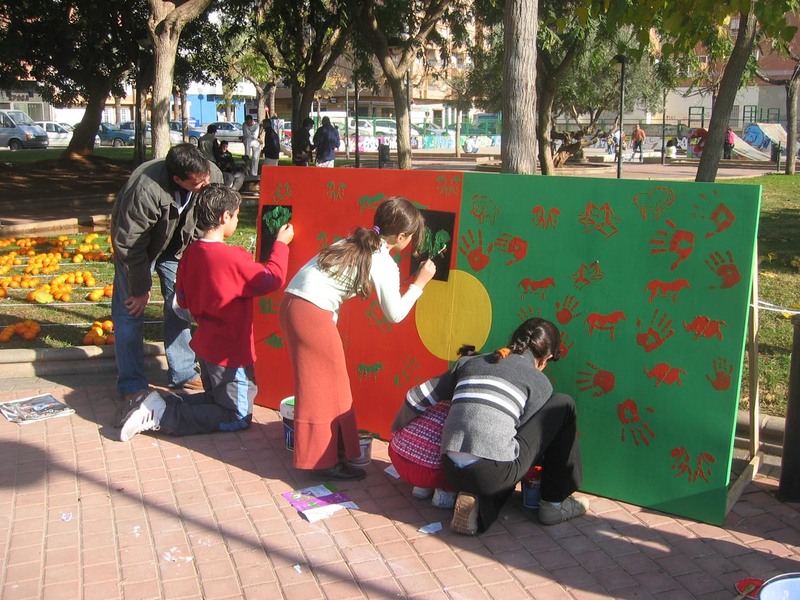 Board, children and paint. This piece was created to allow people using the local park in Vall d'Uixo, Valencia to create the installation over a two day period. It involved hundreds of passers-bye during one weekend. 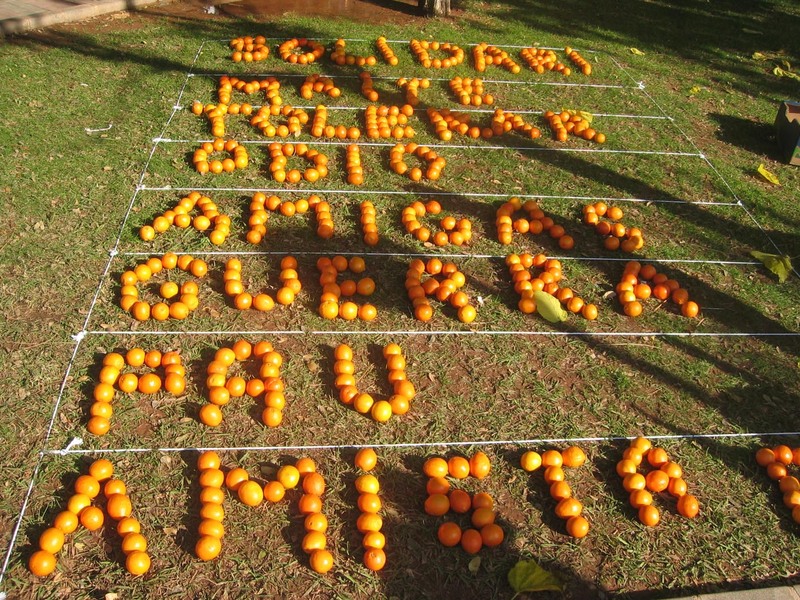 For two days young people and adults painted and wrote words with oranges. Some people just ate them! Painting and sculptures are available to purchase from my eBay Shop - soon. In the meantime you can order directly from me via email.